In lieu of a season-appropriate product like Cupid's Crunch Trail Mix, which is unfortunately not available at any of our nearby Targets, we're going to take a look at this "essence water" today, which was on sale for something like 69 cents at a local Target a few months back. In its favor: it's light and moderately refreshing. I think it would be better in the hot summer months—perhaps after an afternoon of grueling yard work or sports. It would make a nice, lightly-sweet thirst-quencher. It's only 10 calories, yet its main sweetener is real sugar. I think that's where the "essence" part comes in—it's mostly water, and all the other ingredients are there in just enough quantity to add a minimal amount of sweetness and flavor. It's not an overbearing taste at all. But there are plenty of things working against this product, too. 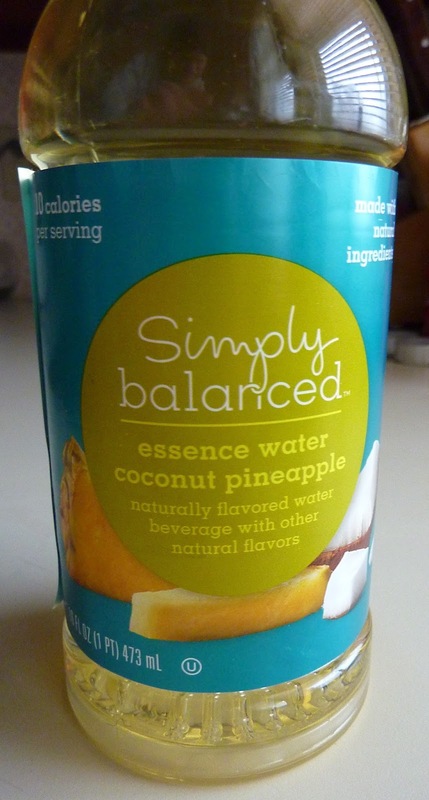 For one, this flavor, in my opinion, just didn't taste that good—and I generally enjoy anything coconut and/or pineapple-flavored. Had the taste been more than an "essence," I would have liked this product even less. I think I'd rather drink half a cup of real pineapple juice and then just chase it with regular water. Also, in addition to real sugar, there's a sweetener called "rebiana" near the end of the ingredients. I guess they used it to keep the calorie count so low. But still, there is a tiny hint of that artificial sweetener taste that lingers in your mouth just a bit after you finish drinking the product. I'm wondering if these beverages were on sale because they're on their way out...anybody else tried them? I found a review of the blood orange flavor that's a bit more positive than this one. Maybe that flavor is just better...? Or maybe I'm just being more critical...? Either way, I think 6 stars is about all I can muster for this happy yellow beverage. I give this drink 6 out of 10 stars.